Teenage Mutant Ninja Turtles Game Pre-Review - GameSpotting! The first level is kinda like a warm up in which you play “ninja tag” but you really don’t and it’s not necessarily a tutorial. The game flows well until you see the comic book pane on the right, in which it tells you to hit a button, but the pane doesn’t go away if you hit that button. So you have to spend about 35 seconds looking at the pane until it goes away. And you can’t move until it’s gone. So it’s a bit unnecessary. Camera views get a bit confusing, since you can’t control them (I don’t know but this might change in the console versions), you can have problems looking up and looking down. Like there is this one part of the “tag level” where you can barely see if there is a pitfall behind this big vent duct. If there was, you would have died. This is normally something that would have been added by Ubisoft for games like “Prince of Persia” and you would expect there is one in this game too. Because of how the game was made, if you fall off, you will start at the last checkpoint, even if that’s from the last level (By the way, the game doesn’t tell you where checkpoints are visually. If you pass one you will see the words checkpoint appear at the bottom of the screen). The fight system is well done. You can do some pretty sweet combos, and control your sword with something like the force. And then if you hold down Z to power up and let go, you can unleash a Speed kill and that is an awesome move. X does this too. 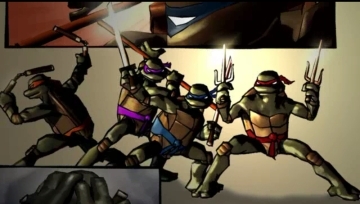 The graphics are good for a TMNT game, I really like the integration with comic books for cut scenes. Plus the comics books are realistic, rather then comic books from the Amazing Spider Man game. The game doesn’t have music, except for the cut scenes and the title and menu screens. The sounds are okay too. 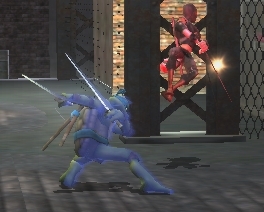 But I really wished there were some Batman Hit Effects, like “Blammo!” or “Slice!”, as with past TMNT games. Sound: 6.6/10 -Sounds like a city at night. It doesn’t have any music because ninjas are stealthy and normally don’t play loud music while running around. The noise when you beat up bad guys isn’t very original. Graphics: 7/10 – The graphics are pretty good. 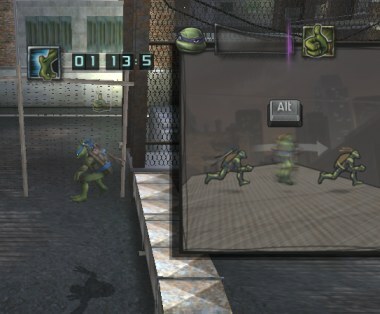 I have seen better but it’s a TMNT game, and games based off movies tend to be a rush job. This game flows a bit away from the current standard of Games based off movies. Controls: 7/10 – Okay, although the default screen tells you otherwise, the controls are wrong. The correct controls are different and work better. Playback: 5/10 – The game can be played back again, why you want to is questionable, but some people might like it. I didn’t get the sense to want to play again during the game. Improvement: 8/10 -Compared to other TMNT games, it’s a major improvement, with more darker scenery (that would suggest it’s for older players), as well as having way better graphics then a TMNT. Overall Score: 7.2/10 – The awkward camera views degraded this rating the most. However this could be fixed if they improved the camera angles and Playback factor. Maybe add some secret collectibles or something. To all you fans: The game releases tomorrow for the Xbox 360, PSP, PS2, DS, Wii, PC, GBA and GCN.